Apple Parer Slices & Cores In 1 Operation with Pivoting, Tension Controlled Arm which holds Paring Blade. Automatically Adjusts To Contour Of Apple, the Blade Can Be Moved In Or Out To Desired Peel Thickness. Clamps To Edge Of Work Surface. Apple Peeling Made Fun and Easy! I've been using these type of peelers for over 20 years. While the seller did a great job in quickly sending them out, the peeler itself seemed inferior to previous peelers. 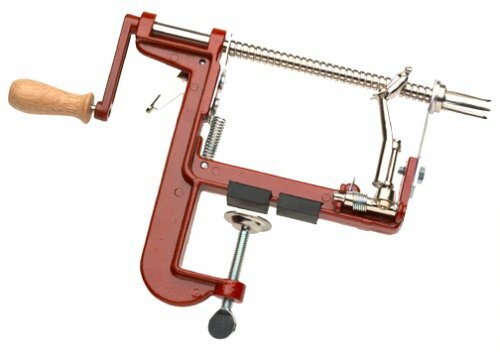 Specifically, the groove in the main spindle appears to not have been cut as deeply as in the past, resulting in the apple not getting fed through the cutters once some resistance is met. This results in a damaged apple, not a peeled and cored one. I currently own about 16 of these peelers, but unless the quality returns, I won't be buying anymore. I have had three of this type of peeler/corer/slicer. The first was this one (The Pampered Chef Apple Peeler/corer/slicer) purchased probably at least 12 years ago which is now getting a bit dull. I bought the one that this review is for and another one (Apple Peeler Corer and Slicer Clamp Base - Back to Basics model A501) recently. There are two parts to this review--the first deals with this TYPE of peeler, and the other deals with this particular peeler. - The slicing blades aren't long enough. My apples are frequently too big to put in the machine until I cut them down, which means I have to peel them by hand as well. - You have to be careful about the coring, just like with any corer. Apples aren't all alike, and it's a little hard to make sure that you have the apple on the prongs straight. So you have to make sure (if you're not using a food mill at some later point) that you cut out whatever little bits of core are left. - It's a little messy. Juice sprays a bit and drips. You want to have a towel under the table, and you want to move anything a couple of feet away from the machine, unless you don't mind cleaning apple juice off it. - The machine always misses some peel around the stem and blossom ends of the apple. It is trickier to remove the peel from the apple manually once the apple has been sliced. Despite all of this, it is still a lot handier to use a good one of these than to do it by hand. This one is a good one. It does all that it says it does as well as can be expected. It is a little annoying that it takes two hands to make the peeling arm stay back, but that's really the only difference I found between this one and the Pampered Chef one which is a lot more expensive. It worked well, and was sharp enough, and stayed relatively solidly clamped to the table. This thing is genius. I am highly incompetent in the kitchen and only bake pies because I like to eat them. Sadly, I am also lazy, tending to result in my having to wait for extended periods of time between eating pies I've baked using Grandma's tremendous recipe. It's all over now, though. Now, with the peeler, I eat pies. I eat a lot of pies. The peeler is genius. I just bought one for Grandma and Uncle Ed. Makes very quick work of apples and potatoes, but is hard to clean. If you like making apple pie, apple sauce, or mashed potatoes, this little device will save you lots of time. Basically, you stick an apple or potato and the spikes and turn the handle. In a few seconds, you have a peeled and optionally cored and sliced apple or potato. It's sturdy and well made. I'm giving it only 4 stars, though, because it's a little tricky to get it on the counter firmly and because it's a little bit of a pain to clean. The only one I would ever own! The apple peeler and corer does what it says it does pretty well. However it has a couple of serious flaws, it is difficult to remove apple cores from the prongs, I cut my thumb badly trying to do this. More generally the design makes it very difficult to get clean and dry and, because it is made of steel, drying it well is essential. Despite my best efforts the central shaft on mine has rusted. I had mine for 20 years and it recently broke. But heck, that's pretty good lifetime for this sort of gadget. On the downside, when I got it, it didn't peel very well. But after fiddling with the alignment of the blade it worked great. In addition with rough sided home grown apples, it can skip some of the peel. If you guide the cutter with your free hand it does most of the peel. Then a sharp bird's beak knife finishes the job in one or two swipes. For one apple it's not worth the cleanup vs a knife. For a pie with 6 to 8 apples it's wonderful. All the slices are even so the pie cooks evenly. I've tried this thing at least 3, maybe 4 times now. Granny Smith apples must be the roundest apples you can find. I've read some reviews about apple peelers that say round apples work best. Its also best to use fresh, firm apples. Tonight, I pulled this "not-so-handy-dandy" gadget out for one final try. I had a very nice, fresh Granny Smith. This gadget is a total waste. Its hard to get the apple lined up perfectly, as mother nature didn't grow them to be used in this machine. Even though it can't be lined up perfectly, the coring part still works fairly well. Its all down from there. One must swing the little cutting arm around and hold it in place as the apple rotates. So, right from the get-go, at least a quarter of the apple will go unpeeled. But no matter how you adjust the blade, it still won't do most of the apple well. What you end up with is a buch of rings (actually, a large spiral that can easily be cut into rings). Some will have been peeled, some not. Now you get to peel rings, which is 20 times harder than just peeeling the apple when it was whole. I can't believe how many people are saying wonderful things about this contraption. Maybe they're more talented than I, who knows? I'm gadget-happy and really wanted this to work. It doesn't. I don't know how large food companies peel their apples. I doubt they use this device. Someone said this was great for an older person. I can't see how. Another said that it was great, they peeled a bushel of apples quickly. Last time I used this device, I did a bag of maybe 10 or 12 apples. It seems to me that each apple is just wasting more time. I'm glad for the people that are happy with this product, all these glowing reviews couldn't all be fakes, written by company employees. I just don't get it. It seems to me that by its very design, its doomed. I know OXO makes pretty good stuff, I know they make good peelers, they probably make an apple corer. If you have a good peeler (or even a crummy one like I have), you can do anything. This gadget is a time waster, and a waste of space. I use this to peel/slice/core apples with my grand daughter. She eats apples EVERY day now, after school. It is a great activity to share with kids, and is also a handy gadget if you make a lot of pies/cobblers/crisps/gratains. My only complaint is that I wish it had the suction base. This is a handy, dandy, time saver, hand and wrist saver! My sister inherited our dad's peeler/corer; (it's been around for....ever). I was so pleased to recieve this one so quickly. So far i have done over 1200 lbs. of apples, taking my time and canning, ect. in just one week! Whipped up a deep dish apple pie the other day, only took me 20 minutes to go outside, get 15 apples (really big pie) and have it in the oven. Trust me, if you had peeled as many apples with a knife like I have...This handy dandy tool will make you feel like your on vacation! I purchased this through Amazon with full knowledge that there were some 'bugs'. Overall, however, I have been pleased. Progressive does send an extra blade with the peeler/corer and the blade is fairly easy to adjust. I do have difficulty trying to 'center' the item being cored. I wish the mechanism would hinge up (as a stand mixer might). It would be easier to line up the apple that way. Regarding the small clearance in the clamp: What I have done is to mount the peeler/corer on a heavy, old cutting board. It then hangs part way over the countertop or bake station and allows some stability as well as portability. I have also noted this peeler/corer will do a very nice job on cutting home fries without having to mess up the food processor.